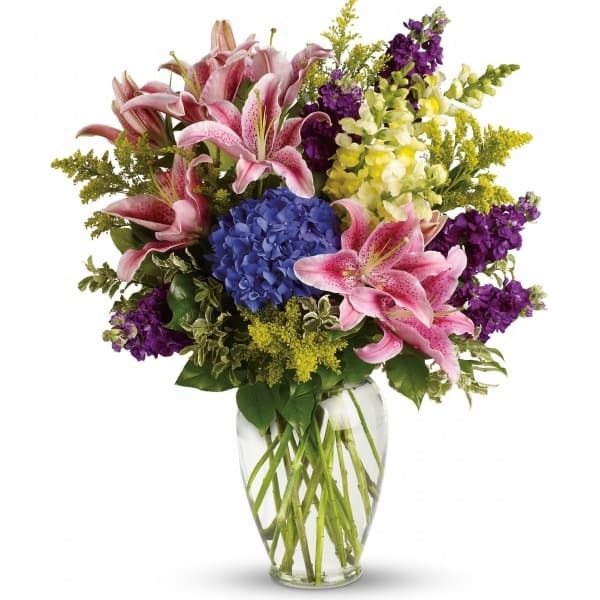 Let the family know that you are thinking of them with this lovely bouquet of pink lilies and blue hydrangea, arranged in a beautiful clear Ming glass vase. • This bouquet also includes snapdragons, purple stock, and assorted greenery. 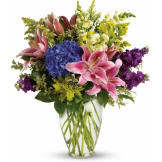 • Vase bouquets can be delivered to the funeral service or directly to the family residence. 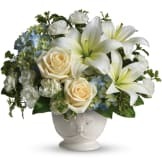 Flowers will be received by a Goldfinch Funeral Services' staff. I did not get to see the arrangement but was told it was very nice and a beautiful reminder for our friend who passed away. Thank you for being so prompt in delivering it. It is still beautiful today, and the blooms are still opening. My mom would have loved it. And it smells heavenly when I go into the room where it is. Beautiful flowers that were unique and brought joy in a time of sadness. Received many compliments! The bouquet was exactly what I hoped it would be: a beautiful reminder of a lifetime of love that lasts forever. 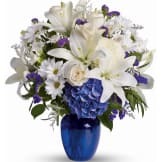 This arrangement was perfect for offering sympathy while celebrating the beauty of a loved one's life. All of our flowers are designed and delivered by hand from a local florist in in Conway.